We like to be taken seriously. Really, we do. We think we are all that because we have this thing called “brain”. But we really are, at the very best, just really, really bizarre. One scene in Over the Hedge sums up the gist of matters. And sure, we now know that the Canadian food guide turns us into cows by drowning us in milk and stuffing our guts with grain, and basically has our health at the bottom of its long list of agendas. So of course, we got all smart and creative, and came up with all these fancy words like low-fat, no-carb, south beach, sugar free, grain free, gluten free, vegan, protein, paleo, and even this one, which makes me laugh, called the hipster diet. Don’t get me wrong, there’s no judging going on here, but I found it fascinating how all of these are essentially the same! Obviously, I’m not saying that eggplants are the same thing as eggs nutritionally (I know I might seem kind of crazy at times, but no, I haven’t quite lost it yet). However, what I do see as an underlying pattern is the fact that with any type of these diet, we put the blame on a particular food, and simultaneously justify some other group(s) as “good to eat”. Most of these diets actually go as far as to say, go ahead and eat “unlimited” amounts of these “OK” foods – just make sure you don’t touch those. So does it all boil down to, again, the bottomless pit that is our stomach? That we simply want infinity, which we reason to be an acceptable demand so long as we restrict ourselves and persuade ourselves that we have a sliver of self control in us by banning certain foods? Take this with a grain of salt, and don’t take me too seriously. But just remember why you eat. I couldn’t care less what you believe about food, but I hope you care more about yourself than whatever bizarre trend is sweeping the streets of LA and New York right now. Mochi is a flexible concept. You can stretch it many, many, ways. If I wanted to, I could say that it’s completely fat free, dairy free, egg free, cholesterol free. That it’s vegetarian, vegan, gluten free, all-natural, or even organic if I wanted to. But, at the end of the day, you will definitely die a devilishly delicious death if you have a dozen of these for dessert after dinner. Or, actually, even without the dinner. Basically, it’s sugar, that’s about it. But then again, what good is noshing if nothing satisfies our tooth for pillowy, chewy, sticky, sweet dough enrobing a thick, fudgy, nutty filling of pureed red beans? To make the sticky rice dough, combine the rice flour and brown sugar in a large microwaveable bowl. Stir in a third of the water at a time until a thin smooth batter forms and there are no lumps. Dust a large glass or ceramic baking dish generously with corn starch. Cover the bowl of rice batter loosely with plastic wrap and pop it in the microwave for 60 seconds. Take it out, and it will look completely wrong, that’s okay. Stir it vigourously with a wooden spoon or chopsticks for 5~10 seconds. Cover it, and pop it back in the microwave for another 60 seconds. Take it out, and stir until evenly gummy. Cover it, and blast it for a final 30 seconds, which should make it puff up quite a bit. Take it out, and scrape the sticky dough into the dusted dish. While the dough is still hot, divide it into 8 equal portions. Dust each piece with more corn starch to prevent sticking. Working with both hands, gently stretch a piece of dough until 2-inches in diameter. Place a portion of the red bean filling in the center, and pinch the edges of the dough together to close. Repeat with the remaining ingredients. To give the mochi an “airbrushed” finish, roll it in corn starch again, then place in a large dome-shaped strainer. Begin swirling the strainer in a circular pattern so the mochi rolls around in it in a circle. 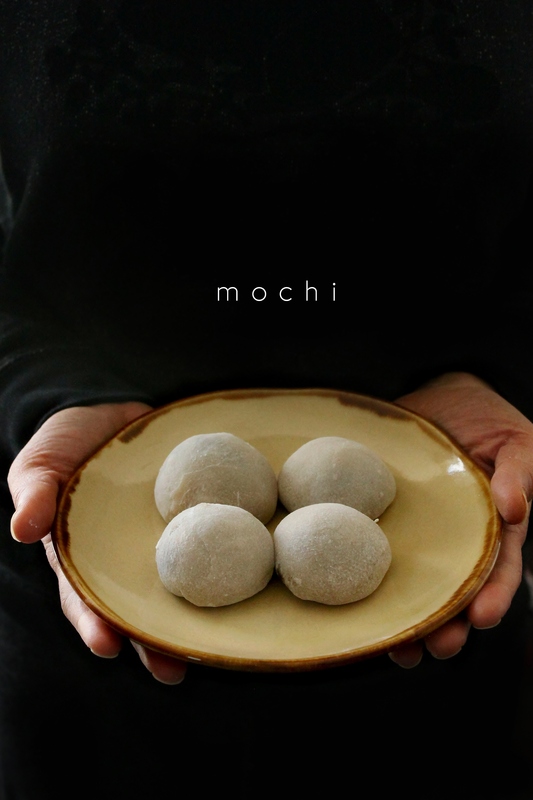 Stop once you’re happy with its roundness, then do the same for the rest of the mochi. Enjoy, with what other than a cup of matcha? Love the light of your photo, and your recipe, of course! Thanks Diana, for stopping by and the lovely comment!